A broken finger can really put a crimp in your ability to perform daily tasks. 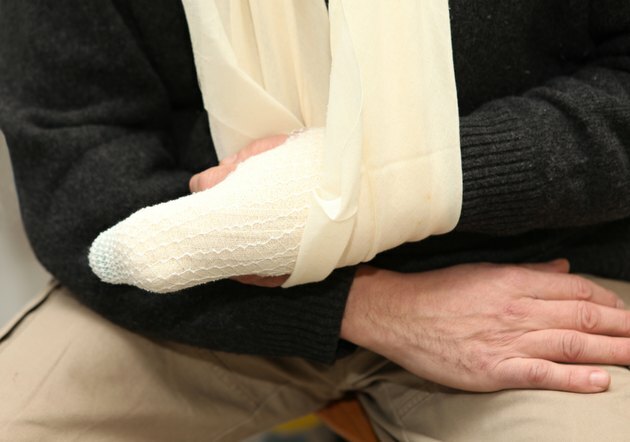 These injuries often require several weeks of immobilization to allow the bone heal correctly. However, tendons that move your fingers and the ligaments that hold your finger bones together can become stiff. A study published in 2012 by "The Open Orthopaedics Journal" points out that long-term stiffness is more likely to be a problem if your broken finger is immobilized longer than 3 weeks. Because broken fingers are often splinted in a straight position, it can be difficult to bend the finger once it has healed. Exercises such as tendon glides, blocking exercises and grip strengthening can improve finger bending after a fracture. Tendon glides are a group of exercises that improve your ability to bend your fingers and make a fist. The tabletop fist bends the largest knuckles while keeping your fingers straight. The hook fist bends the middle and smallest joints of your fingers while keeping the largest knuckles straight. A flat fist bends the largest and middle knuckles of your fingers while keeping the smallest knuckles straight. The full fist bends all the joints of your fingers at the same time. You might perform some or all of these exercises, depending on your specific injury. Depending on the location of your finger fracture, you may have difficulty bending one particular knuckle after the bone heals. Blocking exercises help direct force to the stiff knuckle to improve your ability to bend. One finger joint is held straight by the opposite hand while you bend and straighten the joint above. For example, to work on bending the knuckle at the tip of your finger, the middle joint is held in a straight position with your opposite hand. To direct the force to your middle joint, the large knuckle at the base of your finger is held in a straight position with the opposite hand. Gripping exercises can improve your ability to bend your finger. However, to prevent further damage to your finger, you must be cleared by your doctor to perform strengthening activities before attempting these exercises. You might begin by squeezing a soft object such as a washcloth or sponge. As your bending improves, you might wet the washcloth or sponge to add resistance. You might also use exercise putty or other grip-strengthening exercise equipment. Follow your doctor or hand therapist's specific instructions for exercise after a finger fracture. Moving the finger too soon or in the wrong way can lead to permanent damage. Stop exercising and contact your healthcare provider if you experience increased pain or swelling while trying to bend your finger.